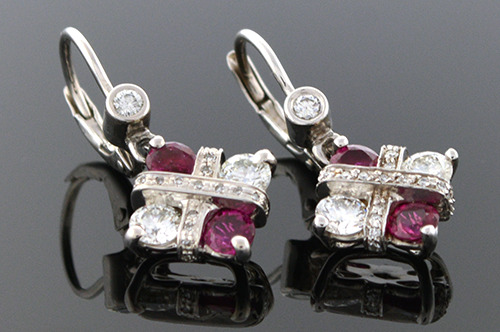 Generous size ruby and diamonds give these precious earrings a powerful look without being overstated. Four rubies that weigh approximately 1.00 carat total weight draw attention with four round brilliant cut diamonds that weigh approximately .60 carat total weight complimenting the rubies. The diamonds have an average color grade of G-H and an average clarity grade of VS(2)-SI(1). The earring design is accented with 40 additional round diamonds that have a weight of approximately .20 carat total weight.